Pastor Dominic Done reveals how doubt can deepen faith and provides readers with a way to wrestle and ask questions while growing ever closer to God. Wrestling with faith and doubt can be profoundly lonely and isolating. Some suffer in silence while others abandon belief altogether, assuming doubt is incompatible with faith. Dominic Done believes this is both tragic and deeply mistaken. In When Faith Fails, Done writes of his own experience with faith and doubt, using Scripture, literature, and the lives of others who have doubted to argue that not only is questioning normal but it is often a path toward a rich and vibrant faith. Taking up specific issues that often create doubt--the silence of God, the place of science, offensive portions of Scripture, and the problem of suffering--Done offers practical ways for Christians to move through doubt into deep faith, a faith that wrestles, celebrates questions, and embraces the mystery of belief. 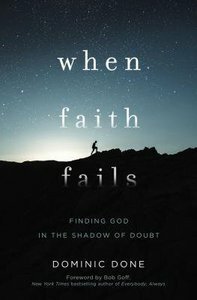 About "When Faith Fails: Finding God in the Shadow of Doubt"